La Belle Poule fought the British 28 gun frigate Arethusa to a stalemate after a five hour battle on June 16th, 1778. Generally considered the first naval combat between French and British forces in the American War of Independence. She was captured by HMS Nonsuch on July 15, 1780. Sold out of British service in 1801. Named Lion when she was originally launched in Rochefort, she was renamed to HMS Belleisle when captured by the British on the 23th of June 1795 at the Battle of Groix. As a lead ship of the line crossing the French and Spanish line during the battle of Trafalgar in 1805, she was entirely dismasted and after the battle she was towed by the frigate Naiad to Gibraltar to be refitted. She was sold and broken up in Portsmouth in 1814. Congress was, similar to other US Frigates, up-gunned by 1812 and carried 24x18pdr and 20x32pdr carronades. Known also as the Yankee Race Horse, the USS Constellation was the second frigate completed under the Congressional authorization of 1794. America had decided, it wanted a Navy. more . . .
One of the U.S. Navy's six original frigates and probably the most famous of all, earning the nickname 'Old Ironside' in the victory against the 38 gun frigate HMS Guerrière on Agust 19th, 1812. In 1897 she was brought to Boston for restoration and preservation and is now a museum ship at Boston harbour. Under the command of Willem de Vlamingh, Geelvinck was the lead vessel in a three ship expedition in 1696 (Geelvinck, Wezel and Nijptang). The expedition was tasked with charting the west-coast of Australia, and to look for survivors of t'Ridderschap van Holland, which had dissappeared in 1694, and Vergulde Draeck, lost 40 years earlier. The USS Independence was one of three ships-of-the-line ordered by the U.S. Navy, the other two being the USS Franklin and USS Washington. Poorly designed as a three-decker (three and a halve feet of freeboard at lower gun deck) she was reconfigured by removing her spar deck and turning her into a 54 gun frigate in 1836. Although Indefatigable was built as a Third Rate of 64 guns, she was cut-down (razeed - don't like that word, not entirely sure why?) in 1794 to a frigate, keeping her 26x24pdr as the main armament on her gundeck, 8x12pdr and 4x42pdr carronades on her quarterdeck and 4x12pdr and 2x42pdr carronades on her forecastle. Named for U.S. President John Adams, she had a very successful career and saw action in several conflicts, most importantly in the West Indies during the Quasi-War with France (1800) and in the Mediterranean against the Barbary corsairs in both Barbary wars (1803 and 1815). The USS John Adams was decommissioned and sold out of the navy in 1867. HMS Megaera was named after one of the three snake-haired furies from classical mythology. HMS Megaera never saw active service as a frigate and like her sistership HMS Simoom, she was converted to a troopship and transport. She was beached and wrecked at St. Pauls Island in the Indian Ocean on the 16th of June 1871. In 1762 HMS Panther and the 28-gun frigate Argo captured the large 'Manila' galleon Santísima Trinidad. She served as a hospital ship after 1791, and was finally broken up in 1813. She was the third British Navy ship carrying the name Panther, her previous namesakes were launched in 1703 and 1746. The USS President was one of the "super-frigates" that caused the British some major problems in the war of 1812. On the 15th of January 1815 the USS President was captured by the British, who were impressed enough to build a replica retaining the name. Queen Anne’s Revenge: Ship (small frigate? ); Length: 31.4 m; Beam: 7.5 m; Depth of hold: 4.1 m; 200 tons; Comp. : 125; Armament: 26 guns? ; France; 1710? Originally called La Concorde, she was captured in 1717 by the Bahamian pirate Edward Teach a.k.a. Blackbeard who re-named her Queen Anne's Revenge. The Queen Anne's Revenge was lost when she ran (intentionally?) aground on a sandbar near Topsail-Inlet off the North Carolina coast and was possibly re-discovered in 1997. Santísima Trinidad was the largest 'Manila galleon' built for trade between the Philippines and Mexico. She was captured and taken as a prize in October 1762 by the 60-gun HMS Panther and the 28-gun frigate Argo. HMS Simoom was named after a hot, dry and sand-laden desert wind and the largest of the 'new' British iron-hulled steam frigates. 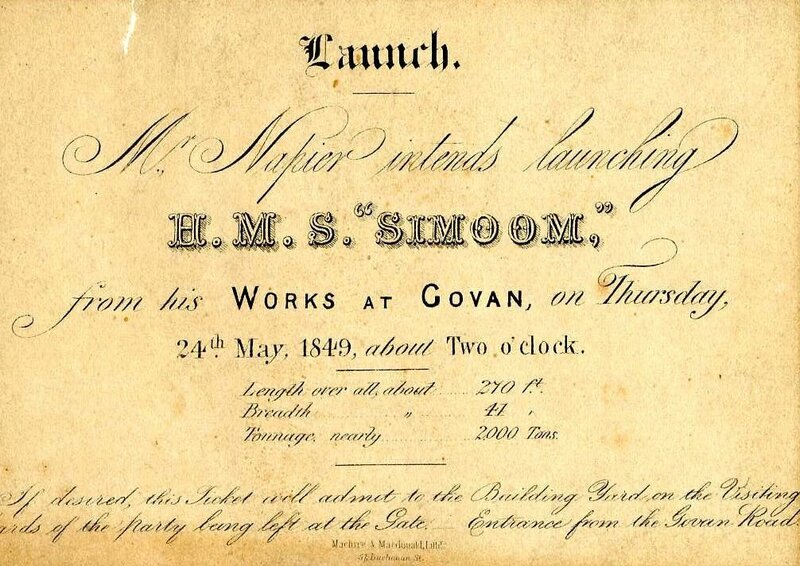 In September 1852 HMS Simoom delivered the masts and rigging for HMS Windsor Castle at Milford. She was converted to a troopship in 1852 and served at the Crimea from 1854 to 1855, at Pei Ho fort in China in 1859 and at Ashantee from 1873 to 1874. She was sold to Norwegian interests in 1887. Larger version of the launch announcement. The USS United States the first of the large 44-gun frigates commissioned by the U.S. Congress to combat French privateers and the Barbary Powers. During the war of 1812 with England she engaged the 38-gun HMS Macedonian on the 25th of October 1812, turning her into a dismasted hulk and taking her as a prize. Decommissioned in 1849, she was commissioned as the Confederate receiving ship CSS United States and scuttled as blockage in the Elizabeth river. She was raised in 1865 and broken up at Norfolk the following year. Among the USS Wabash's accomplishments is her taking part in the capture of Hatteras Inlet, North Carolina and Port Royal, South Carolina in 1861, the same year she captured a number of Confederate brigantines and schooners, and her participation in the assaults on Fort Fisher, North Carolina in 1864/65.